Home › News › What kind of Union does Poland want? Poland fought long and hard against foreign occupation and against an oppressive communist regime to achieve its current solid democratic order. Yet its new government, barely two months in office after winning a convincing democratic mandate, finds itself under fire from EU institutions and from over-excited media commentators who almost have not paused to consider the facts about our ambitious reform programme. Rather than tackling the urgent issues facing the continent – the unstable southern frontier of the EU, a belligerent Russia to the east – the European Union has embarked on an utterly pointless conflict with Warsaw. Poland is not a naughty pupil in need of schoolmasterly rebuke; it is European to its very core. Juliusz Słowacki, our great Romantic poet, described Poland as being at the heart of Europe – and that’s where it belongs. Let us then get the story straight. First, our attempt to overhaul the Constitutional Tribunal is not an assault on the rule of law. We are trying to correct deformations rushed through in the dying days of the previous government. By changing the composition of the court – 14 out of 15 judges were recommended by the governing coalition at that time – it violated the basic principles of a pluralist society. We can find a solution to this stalemate but it is a complex issue and not just judicial in nature. A political compromise is needed but external pressure from Brussels only makes it harder for us to find a domestic understanding. Of course we believe that the proper functioning of the Tribunal is vital for there to be rule of law in Poland. That is why our government has asked the Council of Europe’s Venice Commission to give its opinion. Second, the government’s attempts to repair Poland’s public media sector have also become an unnecessary bone of contention. There is a clear aim: to introduce legislation that restores a sense of mission within public media while simultaneously guaranteeing pluralism, independence and objectivity. Poland’s National Broadcasting Council, our broadcasting regulator, will maintain all of its powers and new laws will comply with EU regulations. It is not being muzzled. Our amendments are trying to restore the right balance between the national regulator and the public media in order to comply with the standards of the Venice Commission. How can these actions be construed as a rejection of Europe? We continue to seek close co-operation with the European Commission and support its active role in shaping European policy. At the same time, though, we believe it to be very important that all EU institutions carry out their responsibilities as required by the founding treaties. One of the most important rules concerning the EU’s work is the principle of subsidiarity which states the EU must perform only those tasks which cannot be performed at a more local level. Better compliance with this rule has in recent years become one of the most important tasks for European institutions. In line with the principle of subsidiarity, we do not require the involvement of the European Commission or European Parliament in our domestic affairs. The European Commission’s statement on 13 January, calling for a so-called rule of law framework to be introduced, has no realistic legal consequences for Poland. It is an internal Commission decision. Yet, we remain committed to dialogue with Brussels despite the attitude of the Commission. Our openness to dialogue was demonstrated again when Prime Minister Szydlo attended a session of the European Parliament and participated in the debate. This artificial argument with Warsaw is a futile distraction. The key question is how competent is the EU in standing up to the current challenges and where should Poland fit into European solutions? Member states are still reeling from the effects of the financial crisis and the future of the Eurozone is far from certain. The EU is rattled by the unprecedented migrant flows that raise questions about the openness of European borders and internal security within the Union. Britain, one of the most important members of the EU and a close ally of Poland, could decide to leave the Union in the near future. Added to this are the serious geopolitical threats on Europe’s borders, which could easily spill over causing conflict and chaos. The priority for member states should therefore be to maintain unity within the Union and to strengthen Common Foreign and Security Policy. It is for the EU to provide effective solutions to these challenges. This is what citizens expect. Together, we need to tackle the problems endangering our continent. Escalating the dispute with Poland on matters of internal politics just further weakens the EU and obstructs the Union’s ability to deal with serious challenges. It is in Poland’s interest for the EU to be a safe place in which our country can anchor its interests. The immediate priority is to stimulate and modernise the European economy. The crisis has robbed many young people of opportunities and hope for the future. Growing discontent within society is causing people to lose trust in European integration. If we do not reverse these trends then we risk the collapse of the whole European project, whose benefits are still much appreciated by Poles. The EU has to be part of the solution and not the root of the problem. To that end, Poland will be an active and responsible member of the EU. We support strengthening internal solidarity and responsibility – but, make no mistake, we will also speak up for the right of individual countries to take decisions that directly concern their citizens. We say “no” to a supranational, federalized Europe because this is not what our countries, and our citizens, need. Democracy in Poland is not under threat. Nor are we turning our back on Europe. On the contrary, we want to play a leading role in building a stronger, flexible and rooted in solidarity Europe. 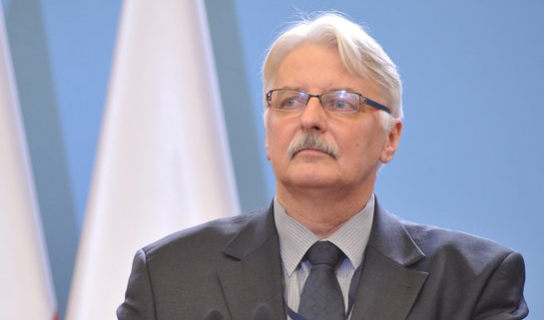 Mr Witold Waszczykowski, Ph.D, is the Minister of Foreign Affairs of Poland.